For very high voltage or very high current applications, the power industry still relies on thyristor-based Line Commutated Conversion (LCC), which limits the power controllability to two quadrant operation. However, the ratings of self-commutating switches such as the Insulated-Gate Bipolar Transistor (IGBT) and Integrated Gate-Commutated Thyristor (IGCT), are reaching levels that make the technology possible for very high power applications. 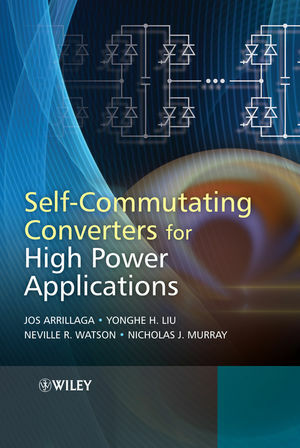 This unique book reviews the present state and future prospects of self-commutating static power converters for applications requiring either ultra high voltages (over 600 kV) or ultra high currents (in hundreds of kA). It is an important reference for electrical engineers working in the areas of power generation, transmission and distribution, utilities, manufacturing and consulting organizations. power conversion for high energy storage. This text has a host of helpful material that also makes it a useful source of knowledge for final year engineering students specializing in power engineering, and those involved in postgraduate research. Professor Arrillaga has been a professor at the University of Canterbury since 1975. He led the Power Systems group at the Manchester Institute of Science and Technology (UMIST) between 1970 and 1974. In 1997 he achieved the IEEE Uno Lamm Medal in Berlin for pioneering work in the field of High Voltage Direct Current, also the John Munganest International Power Quality Award of the Power Industry in the US. Between 1998 and 2006 he won numerous awards for his work in Paris and New Zealand, including the J.R. Scott medal of the Royal Society of New Zealand for services to Electrical Engineering education and research. So far he has published 8 books with Wiley and over 200 papers on the subjects of HVDC Transmission and Power System Harmonics. Professor Liu is currently a professor at Inner Mongolia University of Technology. He spends 6 months of the year in the Department of Electrical and Computer Engineering at the University of Canterbury as a researcher through the EPCA (Electric Power Computer Applications) Fellowship. His work has had a large impact on the development of modern HVDC power transmission. Before joining the Department of Computer Science and Engineering, University of Texas, Arlington in January 2004, he worked at the DSPS R&D Center of Texas Instruments. Professor Liu has won the College of Engineering Outstanding Young Faculty Award, Research Excellence Award and writes for various transactions and journals. He was on the program committee for IEEE MASS 2008 and IEEE SECON 2008, amongst others. Professor Watson has been working at the University of Canterbury since 1987. He has taught undergraduate courses on electric power engineering, power systems engineering and the fundamentals of power electronics, and a graduate course on advanced power system engineering. He writes for many journals including the IEEE Transactions on Power Delivery and has co-written 3 books with Professor Arrillaga, all published by Wiley. Nicholas J. Murray- Received? his BE (Hon) in Electrical and Electronic Engineering from the University of Canterbury (NZ) in 2001, where he has just completed a PhD degree on the topic "Flexible reactive power control in large power current source conversion". He spent 8 years in the pulp and paper industry, the last four as a high voltage and control system engineer. His present interests include power system modelling, artificial intelligence and transient analysis of high ac/dc converters. 1.2 State of the large power semiconductor technology. 1.3 Voltage and current source conversion. 1.4 The pulse and level number concepts. 2 Principles of Self-Commutating Conversion. 2.4 Three-phase voltage source conversion. 2.5 Gate driving signal generation. 2.7 Basic current source conversion operation. 3 Multilevel Voltage Source Conversion. 3.3 The diode clamping concept. 3.4 The flying capacitor concept. 3.6 Modular multilevel conversion (MMC). 4.2 The reinjection concept in line-commutated current source conversion. 4.3 Application of the reinjection concept to self-commutating conversion. 4.4 Multilevel reinjection (MLR) – the waveforms. 4.5 MLR implementation – the combination concept. 4.6 MLR implementation – the distribution concept. 5 Modelling and Control of Converter Dynamics. 5.3 Non-linearity of the power converter system. 5.4 Modelling the voltage source converter system. 5.5 Modelling grouped voltage source converters operating with fundamental frequency switching. 5.6 Modelling the current source converter system. 5.7 Modelling grouped current source converters with fundamental frequency switching. 5.8 Non-linear control of VSC and CSC systems. 6.2 State of the DC cable technology. 6.3 Basic self-commutating DC link structure. 6.6 DC link support during AC system disturbances. 7 Ultra High-Voltage VSC Transmission. 7.3 Multilevel H-bridge voltage reinjection. 8 Ultra High-Voltage Self-Commutating CSC Transmission. 8.3 Simulated performance under normal operation. 8.4 Simulated performance following disturbances. 8.5 Provision of independent reactive power control. 9.2 Provision of independent reactive power control. 10 Low Voltage High DC Current AC–DC Conversion. 10.2 Present high current rectification technology. 10.7 Multicell rectification with PWM control. 11 Power Conversion for High Energy Storage. 11.5 MLCR current source converter based SMES power conditioning system. 11.7 Discussion – the future of SMES.